In the U.S., and many other countries, copyright protection lasts until the death of the creator plus 70 years. Recently dubbed “Public Domain Day,” January 1st each year marks the end of copyright protection for works created by individuals who died 70 years earlier. In 2014, creators who died in 1943 fall into the public domain. 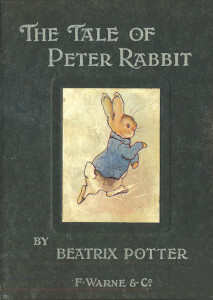 One of those authors is Beatrix Potter, the author and illustrator who wrote The Tale of Peter Rabbit, making her works available for free use. As well, many other notable creators including the world famous composer of classical music Sergei Rachmaninoff, the inventor and futurist Nikola Tesla, the French mystic Simone Weil, the British author Radclyffe Hall, and one of the founders of gestalt psychology, Max Wertheimer, all lose copyright protection for their works of genius in 2014. In some other countries, including Canada, copyright term is life plus 50 years, and in those countries C.S. Lewis, Aldous Huxley, Robert Frost, Jean Cocteau, and the famous poet Sylvia Path, who all died in 1963, enter the public domain in 2014. The last major revisions to U.S. copyright law include the Digital Millennium Copyright Act of 1998 (DMCA), and before it, the Copyright Act of 1976. Importantly, the DMCA instituted “takedown rules” for infringing online materials, and extended copyright term to its present term [see the Complete version of the U.S. Copyright Law, December 2011, PDF]. For many who await the opportunity to use previously copyrighted works, or for organizations who believe works should be in the public domain, Public Domain Day is an opportunity to expand copyright free holdings and databases and to celebrate the role of the public domain in civilization. Every year, thousands of works enter the public domain due to the expiration of copyright protection. At that time these works may be freely exploited by any party for any purpose. Poems can be transformed into the lyrics of songs, novels can be freely made into movies, literary works can be republished at will, and art works and images can be reproduced without permission.